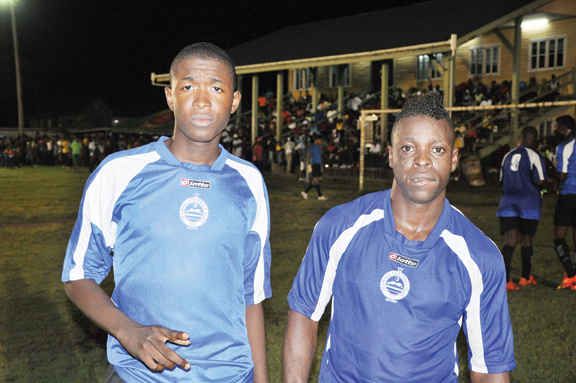 Pouderoyen marksmen Marvin Frank (left) and Lloyd Prince pose for a photo op following the teams win over Uitvlugt Warriors in the playoff for third place. Vergenoegen-based Slingerz FC, just as they have done time and again, proved that they are the best side on the West Demerara after escaping with a 4-1 penalty shootout win against host Den Amstel to capture the inaugural Vitamalt/Aqua Mist sponsored West Demerara Football Association (WDFA) Knockout Cup which ended on Boxing Day, at the Den Amstel Community Centre ground. The two teams’ slugfest failed to produce a winner in regulation and extra time after ending 1-1, forcing a penalty shootout to decide the champion. Playing before a capacity crowd that included Chairman of the Guyana Football Federation Normalisation Committee Clinton Urling and representatives of main sponsor Banks DIH in Non-alcoholic Brand Manager Clayton McKenzie and Aqua Mist Brand Manager Errol Nelson, the combatants treated the fans to an exciting and attacking exhibition of football from the start which must have pleased the Organisers and sponsors. When Referee Maureese Skeete signaled the end where the penalty kicks would be taken, the large turnout of fans converged on the pitch as they attempted to encourage their respective teams and the eventual champions started off in positive fashion when Captain Tichard Joseph buried his right foot shot into the left side of the goal. Den Amstel urged to respond in like manner did just that as goalkeeper fired past his opposite number, sending him in the wrong direction to level the scores. Next up was the big defender Colin Nelson and his effort flew past Hunt to his right to maintain pressure on the host which resulted in their first miss when Travis Hilliman’s shot went wide of the right upright. Joshua Browne stepped up next for Slingerz FC and his screaming right footer beat Hunt into the left corner to give much needed cushion to his team and a spell of sadness to their rival supporters. The usually dependable Delon Lanferman heaped more horror on home fans when his shot ended wide of the left upright as even the loyals commenced a slow march to the exit. Needing to simply score to formalise victory, their hero in regulation time Devon Millington stepped up and calmly smashed his effort past Hunt to instigate wild celebrations among their band of fans, while it also meant that the club came $1million richer and also earned them bragging rights for one year. Den Amstel, though they must have felt disappointed, still walked away with a whopping $500,000. In the individual honours category, Hilliman was adjudged to be the tournament’s Most Valuable Player, while Joao Filho of Slingerz was adjudged the Most Outstanding Goalkeeper. Lanferman and Andre Hector of Den Amstel with five goals each jointly claimed the Highest Goalscorers award. Earlier, Millington’s 3rd minute beauty gave Slingerz FC the lead after he rifled in a weak clearance low into the far corner, beating Hunt to the right to quiet the home fans. However, the early setback failed to stop the encouraging incursions by Den Amstel and Lanferman’s explosive free kick from 26 yards soared just over the crossbar. Shortly after, Hilliman got into the act when his glancing header from a corner mimicked the effort of Lanferman, landing just over the crossbar much to the relief of Slingerz FC players and fans. Encouraged by the two near misses, Den Amstel intensified their advances and got their reward in the 39th minute, courtesy of Hilliman, who eluded his markers following a corner on the right side to head past a surprise Slingerz FC custodian. It was game on after that, but even though both teams attacked with menace, their well drilled defences held firm until the final whistle sounded. Extra time brought no definitive result either, before penalty kicks settled the score. In the third place playoff, Pouderoyen FC made light work of Uitvlugt Warriors, beating them 3-1. The Warriors had taken the lead initially through Keon Duke, who netted in the 3rd minute from the penalty spot. Marvin Frank’s 18th minute strike restored parity, before Lloyd Prince gave them the lead in the 43rd minute of play. Prince returned after the break to seal the win when he fired in from close range in the 72nd minute, an advantage that lasted until the final whistle sounded. Pouderoyen pocketed $300,000 for the victory, while the Warriors collected $200,000.